Did you bet on an Obama win for the election? If you placed your bet at Paddy Power, your check is in the mail! Or even better – in your account. “Romney gave it a good shot and is doing well in the popular vote, but we suspect he’s had his moment in the sun and is likely to be remembered more for his legendary gaffes than presidential potential,” the bookmaker said. The Irish bookmaker has a reputation for correct predictions. In January 2008, they declared the Democrat primaries over and gave it to Obama. That was before Hillary Clinton’s close call. They’re paying out 650,000 Euros – more than $830,000! They’d better hope Obama wins. In the 2008 election, they called the race a full 2 weeks before election day. 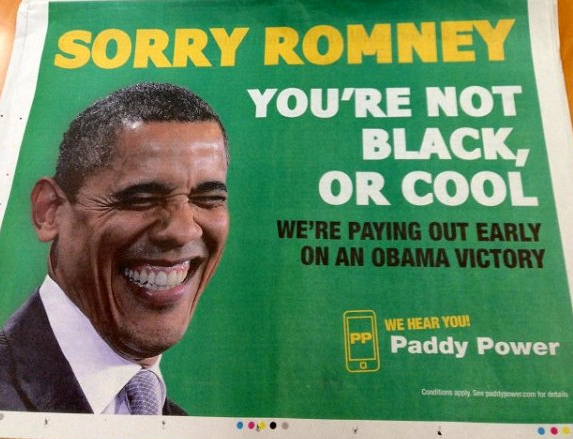 It’s too late to bet on Obama at Paddy Power – otherwise, many of us would have a new source of income! The left and right are sure their candidate will win. Former Reagan speech writer Peggy Noonan is sure Romney will win. Same goes for analyst Michael Barone – both are respected moderate conservatives who put their neck on the line for Romney. But they didn’t put their money where their mouth is. Paddy Power did. What Franchise Will Disney Purchase Next?